Jachin and Boaz were two copper, brass or bronze pillars which stood in the porch of Solomon’s Temple, the first Temple in Jerusalem. Boaz stood on the left and Jachin (‘founding’, Tiberian Hebrew יָכִין Yāḵîn) stood on the right. The pillars had a size nearly 6 feet (1.8 m) thick and 27 feet (8.2 m) tall. The 8-foot (2.4 m) high brass chapiters or capitals on top of the columns bore decorations of brass lilies. Since the dawn of civilization, the entrance of sacred and mysterious places have been guarded by two pillars. Whether in art or in architecture, twin pillars are archetypal symbols representing an important gateway or passage towards the unknown. 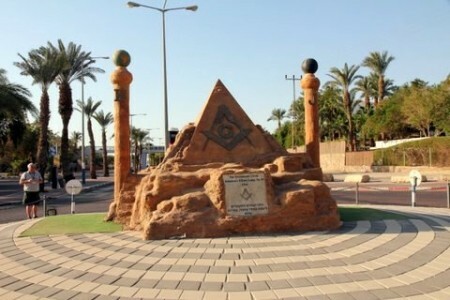 In Freemasonry, the pillars are named Jachin and Boaz and represent one of the Brotherhood’s most recognizable symbol, prominently featured in Masonic art, documents and buildings. This article will look at the origins of this timeless symbol and its esoteric meaning. The concept of twin pillars standing at the gates of sacred places can be traced back to ancient civilizations of Antiquity (some claim from Atlantis, the lost source of Hermetic knowledge). 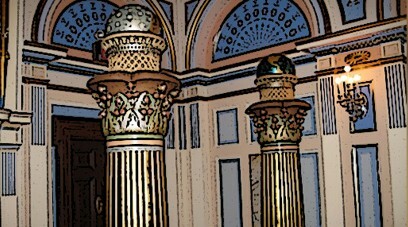 The symbol of the twin pillars have, since time immemorial, guarded the gateways to holy places and mysterious realms. They mark the passage towards the unknown and the otherworldly. In ancient Greece, The Pillars of Hercules was the phrase that was applied to the promontories that flank the entrance to the Strait of Gibraltar. The northern Pillar is the Rock of Gibraltar in the British territory of Gibraltar. 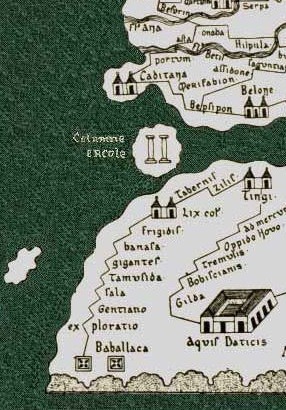 According to Plato’s account, the lost realm of Atlantis was situated beyond the Pillars of Hercules, in effect placing it in the realm of the Unknown. 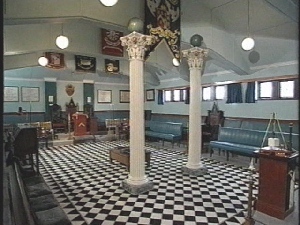 Renaissance tradition says the pillars bore the warning Nec plus ultra (also Non plus ultra, “nothing further beyond”), serving as a warning to sailors and navigators to go no further. Symbolically, going beyond the Pillars of Hercules can mean leaving the foulness of the material world to reach a higher realm of enlightenment. The Masonic usage of the terms Jachin and Boaz originates from the Biblical account of King Solomon’s Temple. 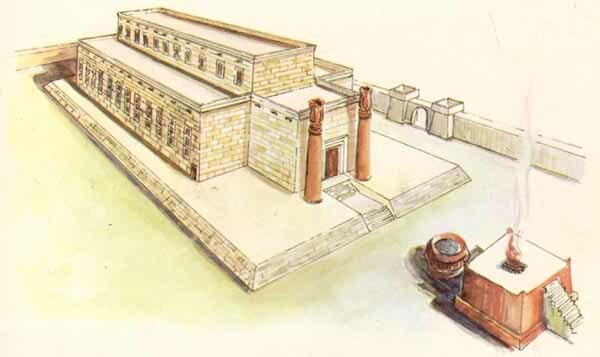 The master builder of the Temple of Solomon was Hiram Abiff, a prominent figure in Masonic ritual. The verses 1 Kings 6:1-38, 1 Kings Chapter 7, and Chapter 8 describe the dimensions, the construction and the dedication of the Temple under Solomon. One passage describes more specifically the twin pillars standing in front of King Solomon’s Temple. The account of Solomon’s Temple is of great importance in Freemasonry as each detail of the building holds an important esoteric meaning. The Twin pillars act as a “portal to the Mysteries” by standing on each side of the entrance to a sacred place. A stylized representation of Jachin & Boaz can be found on the entrance to the Mines of Moria. 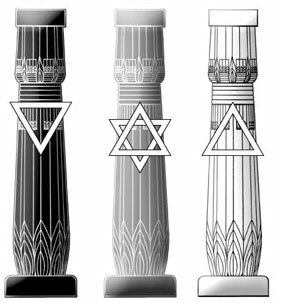 As with most occult symbols, the Masonic twin pillars conceal multiple layers of meaning, some intended for the profane and others divulged in higher degrees of Freemasonry. However, it is generally accepted that the Jachin and Boaz represent the equilibrium between two opposite forces. “Alef is man; Bet is woman; 1 is the principle; 2 is the word; A is the active; B is the passive; the monad is BOAZ; the duad is JAKIN. In the trigrams of Fohi, unity is the YANG and the duad is the YIN. The combining of the two opposite forces of the twin pillars produce the center pillar: the perfected man. The union of the two pillars is said to generate a third pillar, one in the middle, which esoterically represents man and mankind. In Qabbalistic teachings, Jachin and Boaz represent the two pillars of Sepiroth, the Tree of Life. 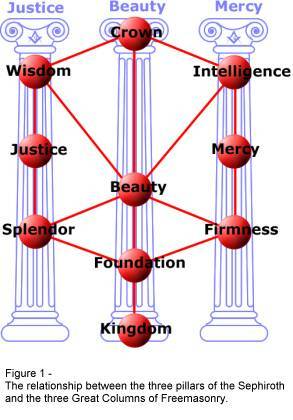 “In the mysterious Sephirothic Tree of the Jews, these two pillars symbolize Mercy and Severity. Standing before the gate of King Solomon’s Temple, these columns had the same symbolic import as the obelisks before the sanctuaries of Egypt. When interpreted Qabbalistically, the names of the two pillars mean “In strength shall My House be established. “In the splendor of mental and spiritual illumination, the High Priest stood between the pillars as a mute witness to the perfect virtue of equilibrium – that hypothetical point equidistant from all extremes. He thus personified the divine nature of man in the midst of his compound constitution – the mysterious Pythagorean Monad in the presence of the Duad. On one side towered the stupendous column of the intellect; on the other, the brazen pillar of the flesh. Midway between these two stands the glorified wise man, but he cannot reach this high estate without first suffering upon the cross made by joining these pillars together. The early Jews occasionally represented the two pillars, Jachin and Boaz, as the legs of Jehovah, thereby signifying to the modern philosopher that Wisdom and Love, in their most exalted sense, support the whole order of creation – both mundane and supermundane.